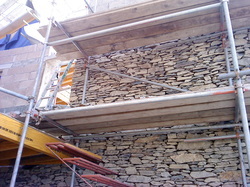 Our team of stonemasons have undertaken numerous jobs for local architect, Robert Gaukroger, including the Forest Classrooms at Windermere School (formerly Elleray Preparatory School) and most recently the Dome House, which was featured on Grand Designs (Episode 28, Series 7), shown on the 3rd November 2010. 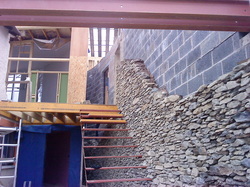 Mr Gaukroger's brief for the Dome House was to erect a 6.5 Metre high x 15 Metre wide, natural slate wall to act as the spine of the building and accomodate a matrix of heating pipes, fuelled by a woodburning stove located in the building, with the intention of acting as a giant storage heater. 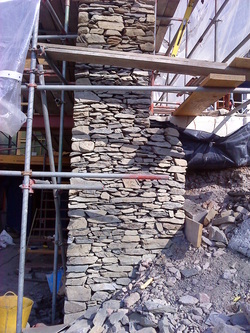 This consisted of using locally sourced blue slate, quarried on site and walled to create and acheive an unrefined, natural finish.